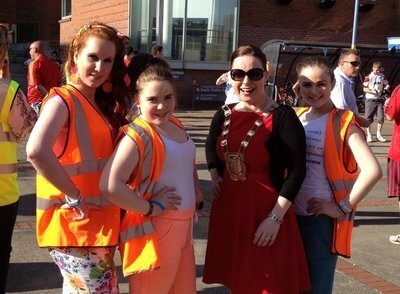 Three girls from Exchange House Youth Service, as part of South Dublin Comhairle na nÓg, along with their peers, helped to arrange the Free Spirit Festival in Chamber Square, Tallaght, in May. Exchange House Youth Service attended this festival with 14 young people. The festival aims to raise awareness and provide information to as many young people as possible about mental health. Mental health is an important issue for the young people of Comhairle na nÓg due to the upcoming Junior and Leaving Certificates. “This is an important time in a young person's life but it can also be a stressful time.” said 15 year old Comhairlí Christine. They arranged the three hour festival which included guest speakers such as Dr. Tony Bates, the Director of Headstrong, and the Mayor of Tallaght, Ms. Caitriona Jones. There were workshops of all kinds to promote looking after your mental health and well being. These included workshops in sports, beauty, health, music and nutrition. There were information talks from Aware, Volunteer Ireland and the Wellbeing Café. There was also much fun to be had at the festival including a mime artist, a graffiti wall, giant games, and guest singers such as Kevin Keeley from the voice and Bipolar Empire. The festival was a huge success and all involved were excited about the response and the amount of young people that were reached by hosting this festival. Everyone who attended was given a bracelet which had the festival tag line, “Breath, Relax, Smile” on it as a reminder to everyone to look after their mental health.